Bad: Puzzles are super easy and investigation is not very important. Lovecraft’s Untold Stories is a retro-style dungeon crawler action-adventure RPG, currently in Early Access. 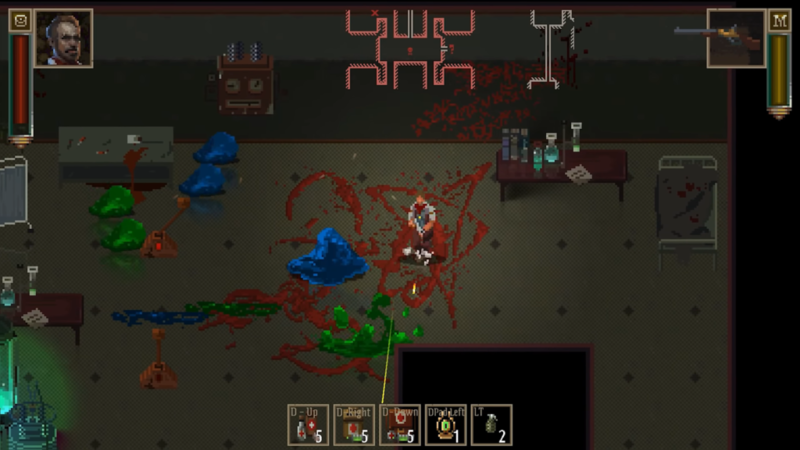 This game puts you in a Lovecraftian setting, where you’ll fight your way through tons of cultists and hordes of strange monsters in randomly generated levels. The game has been developed and published by LLC Blini Games. In Lovecraft’s Untold Stories you initially play the role of detective John Murphy, in a gloomy Lovecraftian universe. You can unlock quite a few other characters in the future, and each character has an extensive background story which you can read in the character selection screen once you unlock that character. This background explains the motivation of your character, and you’ll get a short prologue as you start the game. The story of the game is divided into several chapters, each chapter is represented as a certain location you’ll need to fight your way through. As the chapter is loading, you’ll be able to read the story behind that location. While exploring the environment you find yourself in, you’ll encounter lots of mysterious objects which will further enrich the setting, giving hints about its strange or even twisted purpose as you investigate it or even try to experiment with it. Lovecraft’s Untold Stories has the look and the feel of a classic dungeon crawler action RPG. It has retro-style pixel graphics, with well animated sprites. The graphic style is dark and gloomy, which fits the setting really well. You’ll encounter tons of strange enemies, ranging from robed cultists to freaky looking blobs, shooting colorful glowing spells at you. The graphics fit the theme really well, and the pixel-art graphics work well with a 1920 themed setting. The game features an eerie and mysterious sounding looping soundtrack, which put you in an uneasy and unsettled state, constantly alert to what horrors will await you in the next room. The soundtrack fits the mood of the game really well! Sadly, there is not much variety in the soundtrack, but since the game is still in Early Access, this will most likely change during development. However, the soundtrack is quite beautiful and the constant loop is never annoying. Lovecraft’s Untold Stories is a retro style dungeon-crawling action RPG. You’ll explore mysterious and gloomy locations where you’ll encounter hordes of ever stranger enemies. Equipped with your weapon you slay your way through the cultists, zombies and monsters to investigate and progress to the heart of this mystery. You’ll work your way through pretty big levels in a chapter. The first chapter, a mansion, has a huge amount of rooms, and as you enter a new room, you’ll never know what awaits you. Rooms can contain enemies (usually multiple), stuff to loot or investigate, chests, shopkeepers, or mysterious objects you can interact with. If you walk into a room with enemies, all doors of that room will get locked with a magical shield as soon as you are inside, and the shield will only be removed when you’ve shot the last of the enemies. Combat is fun and challenging! You can shoot in an 360 degree arc around your character, so you can aim at all enemies around you. Aiming does take some getting used to, but the developer is working on making this easier. You’ll need to dodge a lot: most enemies have ranged attacks, and do quite a lot of damage. If you die, you’ll need to start the chapter all over again! You’ll have many different types of guns you can either loot or buy while exploring. Each weapons has their own properties like reload speed, range, damage, and magazine. Luckily, all guns have infinite bullets, but you’ll need to have a good timing for reloading the gun, because reloading at a bad moment could prove fatal. You have a health bar and a stamina bar. If the HP bar reaches zero, you’ll die. You can die from many things: enemy attacks, traps, poison, etc., so be sure to keep an eye on your health and keep enough health packs and antidotes in your inventory. You’ll use the stamina bar for combat rolls and melee attacks, and it refills rather quickly. However, you’ll have to keep in mind that you can’t dodge forever when fighting a room full of enemies. 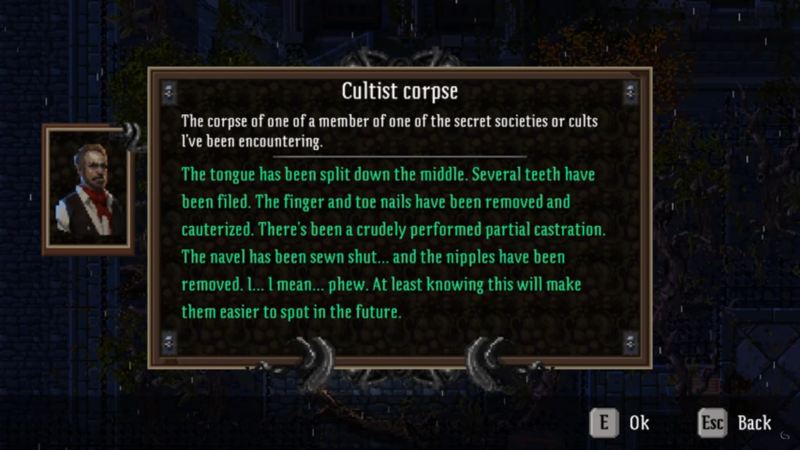 Sometimes the game notifies that you have lost sanity, but it seems sanity loss doesn’t have many noticeable effects. As you are looting many objects in the game, you’ll collect both money and information as a currency: money can be used to buy guns and health packs in shops, and information can be used to buy magical talismans and items you can equip. You’ll also collect lots of junk like books, but these can be sold for either information or money. Some other items you’ll find a lot are keys or other puzzle objects. Keys work simple: silver keys work on silver locks, etc. Some doors need a bit more complicated thinking: you’ll need to insert the right objects to open that door. Usually the hints are pretty obvious, so you’ll immediately know what to do, especially if you already had the right items in your inventory. 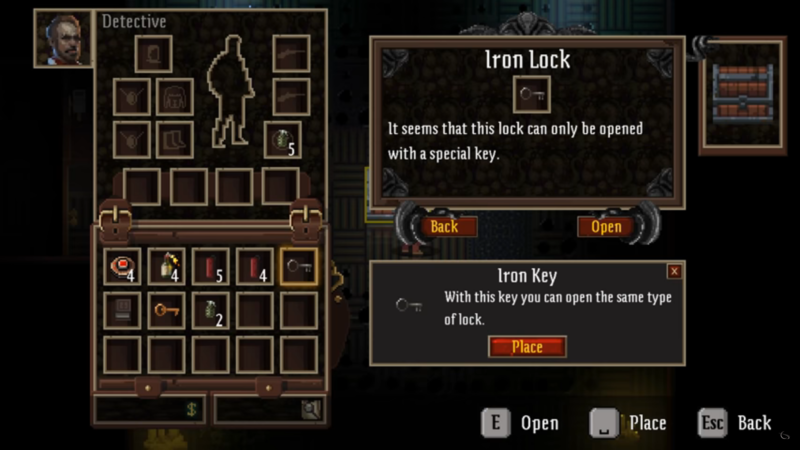 These kind of puzzles to unlock door are the only ones encountered in the game, and they are rather simple. There are several items you can interact with, or investigate. Some grant loot but all give you a short lore text, fitting for the setting. Some interactions with objects can only be performed by a certain character, adding replay value. However, these don’t really seem to impact the game at all, except for a ‘sanity loss’ notification every now and then, which doesn’t seem to do anything noticeably. In every chapter you can encounter shopkeepers: mysterious persons standing in a room which will show you their inventory as you get near them. However, shops are rather far in-between, and your inventory fills up quickly as you are going around looting and killing throughout each chapter. The game looks promising, but everything beyond the first chapter still needs a lot of work. 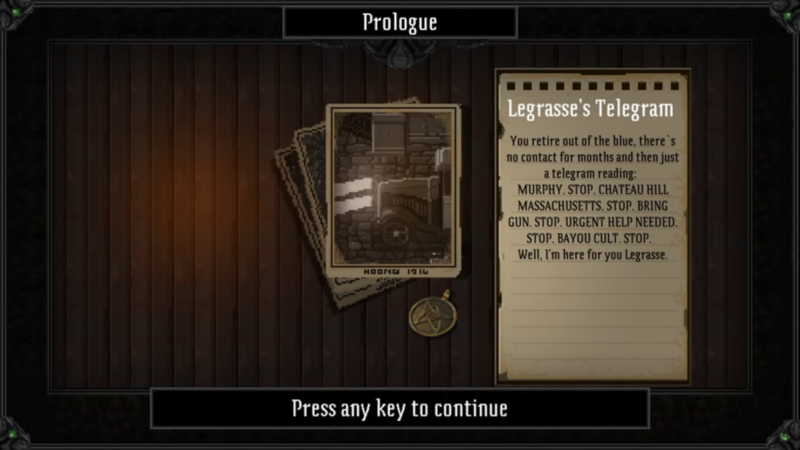 It would be nice if there were more puzzle elements, and more focus on investigation. 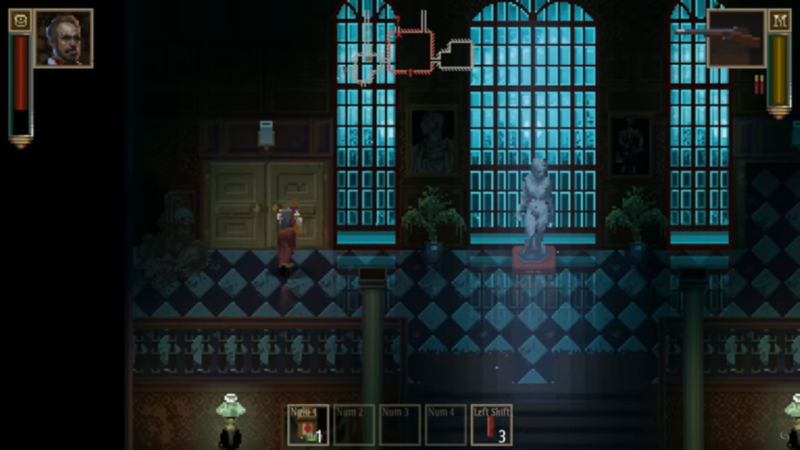 The retro graphics work well for this game, the sprites and environments are beautifully designed and fit the mood and the setting of the game. The music is beautiful, buts does not have much variation as of yet. Combat is fun and challenging, and the environments are well designed and large.